” A warm welcome to Easirent Belfast City Airport Branch. My name is Keith and I’m the branch manager who with my team, welcome you to Belfast! Arriving at Belfast City Airport by air, please call Easirent on 028 9590 8058 when picking up your luggage to arrange shuttle bus transfer to the local branch. The bus will be marked “Easirent” and is only a 5 minute drive away. Arriving at Belfast City Airport by train. If you are travelling via train exit at Sydenham station. A convenient shuttle bus service is in operation from the rail halt to the airport. The taxi rank at the airport is where you should wait for shuttle bus pick up. Arriving at Belfast City Airport by bus. With buses running every 30 minutes through Mon – Sat and every 40 minutes on a Sunday travelling to the airport via bus is quick and easy. The bus route from the airport takes you all the way to the main bus depot, located in central Belfast. Dropping off your car at Belfast City Airport. 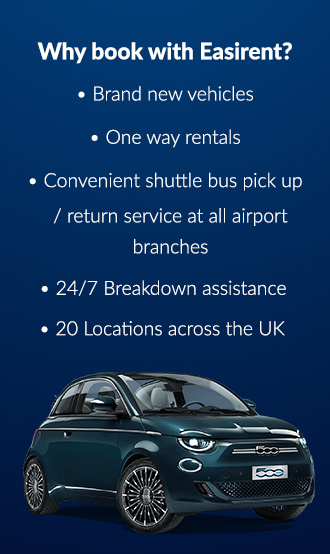 Your car should be returned to our Belfast City Airport branch at the end of your car hire period which is located at 75 Sydenham Road, Belfast (just off the A2 and M3). We can arrange transfer back to the airport from our depot via shuttle bus. Security: There are special security procedures in operation at the airport. For up to date information regarding hand luggage policies, liquids and prohibited items then please visit passenger security on the official airport website. Check-in: The airport advises that your arrive at least 90 minutes before your UK scheduled flight departure and two hours before a European flight departure. Boarding passes and ID should be at hand to show airport staff before boarding where acceptable forms of ID include a passport, driving licence or ID card. The airport stores lost property for three months, if you leave an item on a plane then you would need to contact the airline direct who have their own lost property departments. Passengers are well catered for at George Best Airport with a varied selection of restaurants and food stalls serving up fresh, tasty food and snacks. Bushmills, Costa, Harvest Market, O’Briens and Starbucks all have outlets inside the airport. Looking for some bargains at duty free or have spare time to fit in some last minute shopping before your flight? With big brands like Boots, House of Ireland, WHSmith and World Duty Free there is something for everyone at the airport. Terminals have WC / mother and baby changing facilities located pre and after security.